Phil Pickett first tasted success in seventies band Sailor who scored with hits such as ‘Girls, Girls, Girls’ and 'A Glass of Champagne'. However there can be be no doubt that his greatest achievements have been as a performer and songwriter with 80s pop sensation Culture Club with the charismatic singer Boy George. Phil had been Culture Club's keyboard player and vocal arranger right from the beginning and the band were already huge when he started to collaborate on their songwriting. Talk about being in the right place at the right time! He co-wrote ‘It's A Miracle’ and ‘Karma Chameleon’. The latter song was number 1 in every country in the world that had a chart, selling 1.4 million records in the UK alone." Pickett played extensively on all of Culture Club's records throughout this period and also co-wrote many other songs with the band including ‘Move Away’. Throughout a long career, Phil has also been associated with a huge variety of artists, writers and producers including Paul McCartney, Phil Ramone, Quincy Jones, Joe Cocker, Jeff Beck, Take That & Malcolm McLaren. He has also written songs for West End musical theatre and Hollywood movies, including Electric Dreams, Top Secret & The Lost Boys . Phil’s autobiography explores all the ups and downs of his career whilst being firmly focused on the exploits of Culture Club and Boy George, making this a must read for fans, as well as those fascinated by the music business itself. 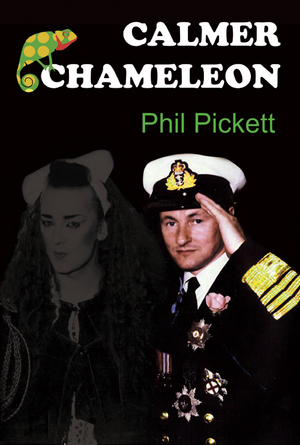 Phil’s autobiography touches on all of his career but with the focus firmly set on the Culture Club years, making Calmer Chameleon an essential read for the band’s legion of fans.